001. Pink Ombre'd my hair last night with a can of that novelty colour spray, Looks way too middle class hippy for my liking, but its alright for one weekend! Its not hideous, its just completely not me. I've been there done that got the scene kid hair cut. 002. Towards the end of this week I realized one key thing about blogging that I'd been slacking on recently. Self Promotion. My traffic has been really static for a while now, getting on average the same amount of views each day for the past few months. I've been slacking on sharing links and just using Twitter to get my new posts out there. However two days of uploading to lookbook, remembering to upload my new looks to my tumblr and using my Facebook page has made my traffic go up by 10%. Promoting your blog is really hard, but my utilizing social networks and actually posting your link around really helps. Im not talking asking for RT's or spamming, just following people, talking to bloggers, sharing your link with other bloggers posts (see not spamming!). Promise you it really does help and worth all the effort. 003. Going Christmas shopping tomorrow in Birmingham, I know I'll probably regret it more than anything but I really need to pick up a few things and I much prefer the Forever 21 to the one thats in London. I'm armed with a list and what I need to buy in each shop so fingers crossed it goes smoothly... who am I kidding! Stressful shopping ftw. 004. Time is drawing closer to last guaranteed Christmas UK shipping for my jewellery store, according to Royal mail is the 20th December, but I'd ideally like any orders by the 16th. If you want to ensure getting things please make sure you order in the next few days, Im sending things every single day at the moment so if you haven't received something withing 5 days of ordering it please get in contact asap. 005. Picking the person to review the Bourjois products later on tonight, I'm still accepting blog links up until about 9pm tonight! I'll email the person as soon as I've picked! The one thing I don't like about having super dark brown/black hair is the lack of ability to go wild (or hippie'd) for a weekend. Love the pink for a blast of short term fun. Great little tips on spreading to word of your blog, when you say ' sharing your link with other blogger posts' do you mean leaving your link at the end of a comment (like i do), if not, how do you feel about people doing that? The pink ombre looks different, but I like it <3 Such a good idea for a weekend! Lovely picture as always! my friend did her hair like that with a can as well haha. It's good cause it washes out so easily! might try it myself. Very true about promoting your blog. I always notice an increase in views if I pop my link on twitter or just comment on other blogs. I always try to remember that very few people just stumble across your blog by chance. Good luck shopping tomorrow - I went to Westfield today to window shop and it was a bit manic - thank god I've already finished my Christmas shopping! And thanks for reminding me how to utilise my Facebook page! Here here about the blog promoting. Have a nice Sunday. I had pink ombre a while ago and I also felt a little too hippie and I think it just didn't suit my personality! I think it looks lovely on you though! Brum was a bit of a mission today but hopefully with the kids at school tomorrow it shouldn't be too busy! At least you're prepared with a list, nothing worse than making up a list as you go (which is my tried and failed strategy!) :) I know what you mean about the pink ombre thing but it really does suit you! I love your hair with this color ! Oh no, you're going Christmas shopping in Brum? I feel so sorry for you - I wouldn't go anywhere near town around now! It is packed, like, ALL the time! Hope you find what you want, haha. Good luck christmas shopping girl! 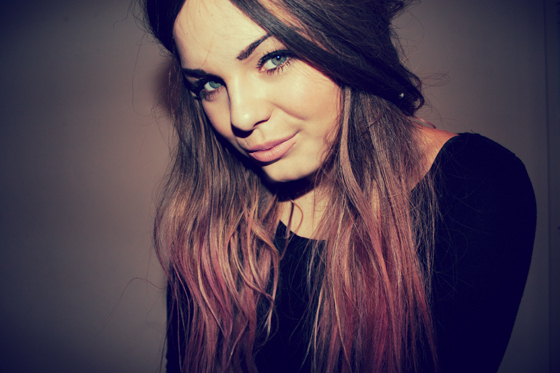 Normally I dislike pink dip-dye but of course you pull it off! Looks lovely, especially as it's so subtle! Consider keeping it for a little longer haha! Loving the pink hair.. better blonde but nice for a little change :) I'm absolutley dying to go 'real life' shopping in forever 21, might make a trip to B'ham in the New year :) Oh, and last thing.. you look absolutely gorgeous in this picture!! Your skin looks flawless! so agree with the self promotion thing, its very hard to keep up with it all but it makes such a huge difference! and i really like your hair by the way, was considering doing mine purple but im so scared it will go wrong! I really like the pink, but I can see why you might feel about it how you do. Dip dye is everywhere right now. Self promotion can be hard to keep up with you're right, I feel like I have to spend my whole life doing it. Though social networking is such a great tool to take advantage of whether you have a business or blog or anything at all to promote. It's free afterall. Good luck with your Christmas shopping, I tried to do most of mine online but when the stock still hadnt been allocated today I cancelled my orders and am going to have to do it in person. Booo! You look so mysterious in this photo, and the new ends look great. I love how blogging is so connected to social media and social networking. It's definitely a great tool for new opportunities and meeting new people. I quite like the pink - but you gotta make sure you're comfotable in it yourself! But make sure to give your hair a massive deep condition - these temp colour sprays tend to have alcohol as one of the main ingredients and that kills/dries out ends like noobodies business! Ooh, I've designated Wednesday as my christmas shopping day. . !I've never shopped in Birmingham before, enjoy! Will be great to see your Forever 21 finds. i like the pink color :) i would really like to try it as well, but for some reason i dont have the heart to do it.. I definitely did this with my hair when I was like 10 and going through a hideous, grungy, Avril Lavigne wannabe stage...difference is this actually looks nice! Your stuff about self promotion was interesting, I can see how true it is as well and that it's something do more of! Good luck with your shopping! Looking beaut. Inspired me to temporarily pink my ends! I think it adds a warmth to a cold winter face :). Intesresting to hear you talk about self promo. Deff worth checking out the new Forever 21 in Stratford btw! I think the pink ombre looks lovely! Does the spray make your hair feel crispy though? I don't think it's at all scene kid with the way you dress. Actually pretty high-fashion and cute.